So the Foundation was finished and the next step was to get some quotes from framing contractors. They ranged anywhere from $48,000 to $8500 and this was just for the labour since I had all the materials from the cottage kit I purchased from Home Hardware. I think some of these local contractors think “here’s a big rich city guy building his summer home, I’m gonna milk him for everything he’s worth” because $48,000 was so ridiculous I can’t imagine how they came to that total. Anyway I lucked out with the framing contractors because it ended up my bosses family have been doing professional framing all their lives and agreed to do the job for me. I paid for their room and board for a week and they were still cheaper then the local guys. They started on a Monday, and on Saturday morning I had a cottage! Truly amazing for a crew of 3 guys. A week later I was able to get a local crew to put the shingles on the roof. TIP: Find your contractors ahead of time. Roofers and Framers are extremely busy and booking well out in advance. 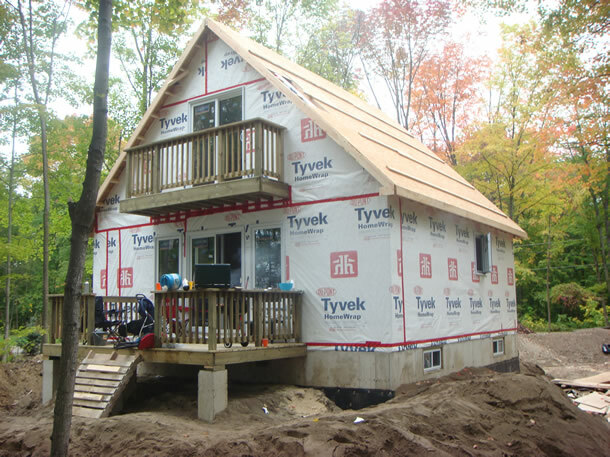 The roofing crew took one day to get the job done and the cottage is now weather tight. I’m working on getting hydro in now and the excavator is finishing up installing the septic tank. That will pretty much do it for the winter. In the spring I’ll get the plumbing, heating, and siding installed then start to finish the inside. I hope by the end of June everything will be finished.